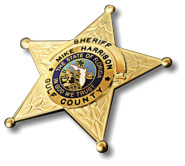 Welcome to the Gulf County Sheriff's Office new website. Our goal is to provide you with a website that is both informative and helpful. We invite you to visit this website frequently. Part of my mission as Sheriff is to restructure our website so it may better provide you with information about your Sheriff's Office. We will be providing you with weekly crime and arrest reports, information on Gulf County's wanted persons, sexual offender and predator notifications, crime prevention tips, traffic advisories, news updates, a link to our Facebook page, and much more. The Gulf County Sheriff's Office has approximately 27 sworn officers and 12 civilian support staff to bring you services ranging from administration, patrol, investigations, school resource deputies, beach patrol, K-9, civil process, communications and judicial services. We take pride in our community and our goal is to serve the community with professionalism, integrity and fairness. Our sworn and civilian employees are committed to providing quality services to the citizens of Gulf County. Together, we can continue to keep Gulf County a safe community to live, work, play, worship, and raise a family. 418 Cecil G. Costin Sr. Blvd.